After many years of searching and visiting France, Spain, Portugal, and most of Europe, we then travelled further afield to South Africa, New Zealand and Australia. 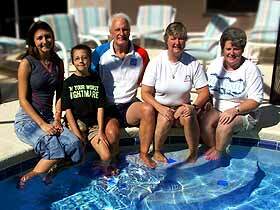 Finally, with much deliberation, it was felt Florida had so much to offer the family, both young and old alike. We travelled to Orlando in July 2004 with the sole intention of purchasing a single family home with our own private pool. We were persuaded by the images depicted so succesfully in our minds after watching all those TV programmes in the UK. After visiting numerous properties both in Orlando and on the East and West Coast. Eureka!!! Finally, we found the home of our dreams at Emerald Island Resort. The single factor that made us choose this development was the overall appearance, and "wow" factor, as we entered the resort for the first time. With its palm tree lined access road, the colonnaded entry complete with a playful dolphin fountain and picturesque rotunda, you are provided with a dramatic sense of arrival, to this gated enclave. Once inside, you feel as if you have entered a special preserve. Emerald Island Resort is surrounded by a conservation area and encompasses over 300 acres, with 11 acres heavily wooded in the centre of the community. We are sure that if you pay a visit to Emerald Island Resort you will be just as enchanted as we were the first time, and still are.